So what if it was a win as hollow as home plate umpire’s Chad Fairchild’s head? The Red Sox, who are soon to be playoff race bystanders, can throw banana peels into the paths of the AL East brethren from now until the heat has to be turned on (unless you did so already, in which case turn in your hardy New Englander card). The Yankees started off as most teams do against Boston with an early run. Instead of his traditional duck fart single Derek Jeter walked. He then advanced to third on Nick Swisher’s double off the wall and scored on Robinson Cano’s ground out. Pedro Ciriaco carried on the grand tradition of Bill Mueller, Yankee Kueller in the third with a leadoff double. Jacoby Ellsbury singled in Ciriaco and was in turn driven in by Dustin Pedroia. The 2-1 lead lasted until the sixth, when Jon Lester began to falter. Amazingly Lester’s patience with Fairchild lasted this late; Brooks Baseball shows how Lester wasn’t getting the low strike call. Pedroia tied the game in the sixth with a solo shot into the first row of the Monster seats. Baseball play went from the sublime to the ridiculous by the bottom of the seventh. Ryan Kalish led off with a bunt that prompted Jerry Remy to say, “You do about everything you possibly can wrong and it still get a hit.” The pop-up improbably found the vacancy between short, second, and third. Next Ciriaco’s bunt with extreme backspin looked like it would roll foul but Russell Martin picked it up before it did so and the speedster was safe at first and Kalish dashed to second. Hiroki Kuroda struck out Mike Aviles but was pulled by Joe Girardi for Boone Logan. Ellsbury broke his bat on a tapper to Swisher who retrieved it easily enough but had no one at first to complete the put out. With the bases loaded Joba Chamberlain lumbered to the bump, inducing a ground out from pinch-hitting Daniel Nava that hosed Kalish at home. 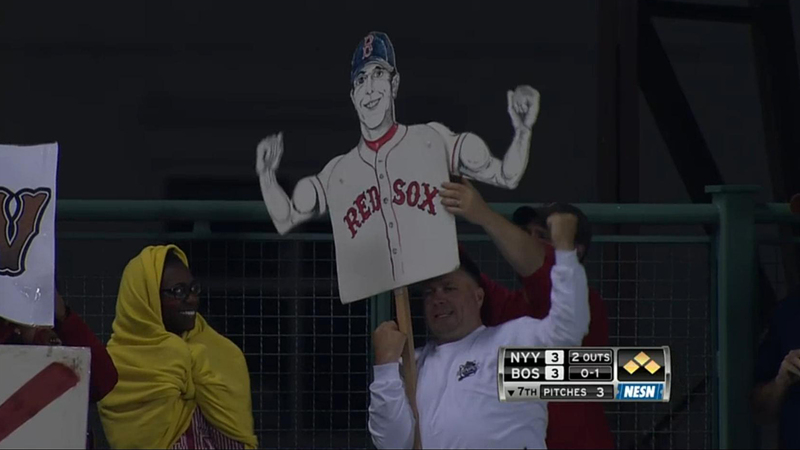 Pedroia was up again and this animated sign was spotted. It seemed to be the same quality workmanship that produced the Papelbon dancing sign with the jigging legs from 2007. The Red Sox relief corps of Junichi Tazawa, Craig Breslow, and Andrew Bailey only allowed two baserunners in their combined 3⅔ innings of work. Their superlative effort set up a dramatic ninth inning. Of course Ciriaco started the excitement. After his single Aviles followed with a single of his own. 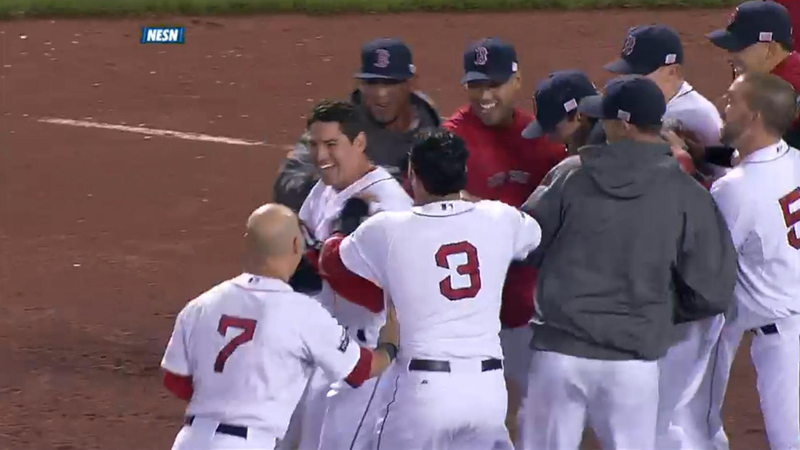 Ellsbury arced the ball into right field and was well and properly mauled by his teammates.